This dramatic painting representing Fort Defiance was created by the late Hermann Wiebe of Defiance and was commissioned by the law firm Weaner, Zimmerman, Bacon, Yoder and Hubbard also located in Defiance. The city was named for Fort Defiance, which once stood where the city now stands. But before the fort was built, the confluence was a major Indian trading center the French called Grand Glaize. It was at this trading center that chiefs of the Miami, Shawnee, Wyandot, Senecas Ottawas, Delaware, Kickapoo, Pottawatomies, Chippewas, Iroquois and Mohawks met to decide how to handle the growing threat of the American military. The British, who had a long time influence in the northwest, encouraged the Native Americans to resist the Americans. The British provided supplies and arms to the Indians. However, in August 1794, as General Anthony Wayne's forces advanced on the location, the council of Indian nations fled the area. Upon reaching the confluence, Wayne ordered the construction of a fort which he said "I defy the English, the Indians, and all the devils in Hell to take it," He called the post Fort Defiance. Wayne built the fort during his campaign against Native Americans in northwest Ohio to provide his men with protection and a staging ground for their operations. The fort was a rough square with a blockhouse located on each corner. In addition to the stockade, a wall of earth 8' thick and a ditch 8' deep and 15' wide protected the fortifications. 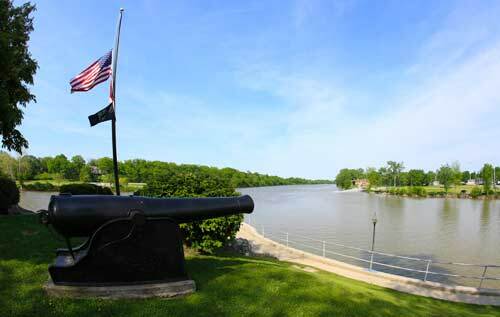 From this point Wayne's army marched further north against Native American forces that had gathered at the foot of the Maumee Rapids. That engagement became known as the Battle of Fallen Timbers. 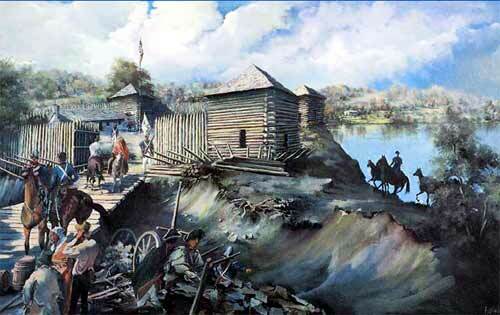 After the Battle of Fallen Timbers, Wayne used Fort Defiance as his base. He ordered the destruction of all Indian villages and crops within a 50 miles of the fort. When Native Americans and the United States signed the Treaty of Greene Ville in 1795, the natives permitted the Americans to maintain a trading post and the fort, although as part of the treaty, Americans had ceded the right to settle this portion of Ohio. From 1794 to 1810, there was a tenuous peace between the American's and the Native Americans. During this time, Fort Defiance served as one of the western-most outposts in Ohio. As relations with the British began to further deteriorate, it became increasingly apparent that the British were not content to leave the area as agreed after the American Revolution. Once again they were encouraging the Indians to rise up in resistance against the Americans. In early 1810, William Henry Harrison used the fort in his attacks against Indians. 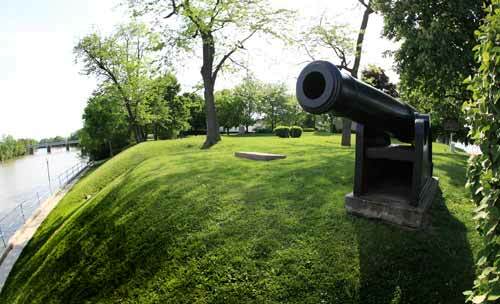 Later as the War of 1812 began, the fort was used for attacks against the British. Modern-day Defiance, was founded at the fort's location in 1822. Local Indian tribes had signed away their rights to the surrounding land in 1817. By 1846, Defiance had about 700 residents. The town consisted of 2 churches and 5 stores. Over the next 30 some years, Defiance's population increased to almost 6,000 residents. The growth was attributed to 2 railroads passing through the town and support businesses sprang up to meet the needs of nearby farmers. By 1886 Defiance had 4 newspapers, 13 churches, and 2 banks. The largest single employer in Defiance was the Turnbull Wagon Company, which employed 190 workers. Numerous other businesses produced wagons, carriages, and agricultural implements for local farmers. Today Defiance has a population of about 17,000 and is considered by locals as the city that has big city appeal with a small town feel. Defiance cherishes and honors its great past. Numerous historic homes and buildings are preserved, some dating to the middle of the last century. In addition, history itself is preserved in AuGlaize Village, a project started in 1966 by the Defiance County Historical Society. The Village recreates life in earlier times. 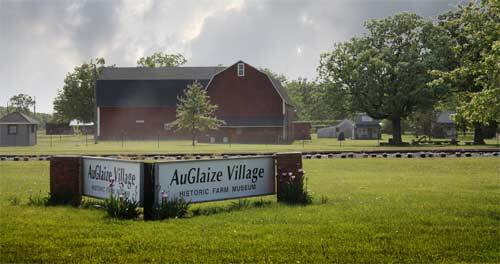 A visit to AuGlaize Village, located 3 miles west of Defiance, is a unique experience. Its collection of 17 restored and reconstructed buildings date from 1860 to 1920. One of the features of AuGlaize Village is Museum Street of Shops located in the 1920 livestock barn that is the only original structure on the historical site. Inside the barn are 8 shops including a 1906 dentist office that was moved there from Edgerton. Also included is a print shop, weaver's studio, a cooper, broom factory and a brickyard display. Defiance is proud to be the home town of 2006 Indianapolis 500 Champion Sam Hornish Jr. and LA Dodges pitcher Chad Billingsley. The book The Prize Winner of Defiance, Ohio was the true story written by Terry Ryan about her mother Eveylyn Ryan. The book was recently turned into a movie by the same name and starred Julianne Moore, Laura Dern, and Woody Harrelson.